This study aimed to investigate the effect of glutamine supplementation on the intensity and duration of oral mucositis related to therapy and on proinflammatory cytokines in patients with head and neck cancer (HNC) who were treated with chemoradiotherapy (CRT). In total, 28 outpatients with HNC (24 male and 4 female) who were admitted to the Gazi University, Department of Radiation Oncology, between October 2008 and November 2009 were retrospectively evaluated. The mean age of the patients was 18?76 years. All the patients were histopathologically diagnosed with squamous cell carcinoma. Of the 28 patients who were included in the radiotherapy (RT) program, five were postoperatively included and 23 were included according to organ protection protocols. Eighteen patients prophylactically received oral powdered L-glutamine (Glutamine ResourceR, Nestle) starting from the first day of RT at a dose of 30 g/day (10 g each at 8-h intervals by mixing with water or fruit juice). For these patients, glutamine supplementation was continued until the completion of RT. Ten patients did not receive any supplementation product. At the initiation of RT, height and weight were measured for all the patients. 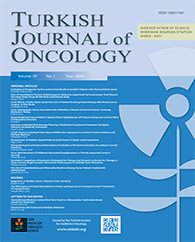 The grade of oral mucositis was evaluated using the "Radiation Therapy Oncology Group (RTOG)" scoring system. During RT, changes in the weight of patients were routinely evaluated, whereas oral mucositis scoring was performed every week. At the beginning, during, and at the end of the therapy, serum IL-1 beta, IL-6, and TNF-alpha levels were measured, in addition to performing routine blood tests. The incidences of grade 2 mucositis were comparable between the groups who received and did not receive glutamine supplementation (42.1% and 44.4%, respectively). However, the incidence of severe mucositis (RTOG of ?grade 3) was significantly lower in the group receiving glutamine supplementation than in the group which did not receive glutamine supplementation (5.3% and 55.6%, respectively; p=0.008). The day of onset of mucositis was the 18th day of the therapy in the group that received glutamine supplementation and 14th in the group that did not receive glutamine supplementation, and this was statistically significant (p=0.007). Similarly, the median dose at which mucositis was started was 36 Gy in the group that received glutamine supplementation and 28 Gy in the group that did not receive glutamine supplementation (p=0.006). The two groups did not show any statistically significant difference in terms of weight change (kg), percentage of weight change, and BMI (kg/m2) when the changes of weight were examined at the beginning and end of the treatment (p=0.42, p=0.47, and p=0.44, respectively). When the changes in serum TNF-alpha, IL-1 beta, and IL-6 levels were compared at the beginning and end of the treatment, the groups did not show any significant difference (p=0.16, p=0.08, and p=0.77, respectively).